Ulta has been killing it with the new brands lately--Zoella Beauty, Dose of Colors, Sleek, MAC--all brands that were previously not available at Ulta or Sephora. I was especially excited to try Sleek products considering how much I've heard about them! Sleek is a UK brand that I am constantly hearing about from the UK bloggers I follow, so I can't wait to finally be able to try the products that are raved about. One of the most hyped products from Sleek is their highlighting palette, particularly the Solstice palette. The shades in that one didn't appeal to me much, but this Cleopatra's Kiss palette looked much more wearable. At Ulta this retails for $15.99, so it's on the pricey side for the drugstore, but considering you get four products in one it is still a good deal in my opinion. Sleek is also cruelty-free! The packaging of this palette is simple and well, sleek. It's gold and about the size of my iPhone 6 screen. The front of the palette is definitely prone to fingerprints, which is annoying, but overall I like the packaging and it feels sturdy. It includes a mirror and a little brush, which I'm going to throw away, and four pans of highlighter: two creams and two powders. The top row includes a darker bronze/gold powder and a bronze cream, and the bottom row includes a pale yellow-gold cream and a pinky-champagne powder. 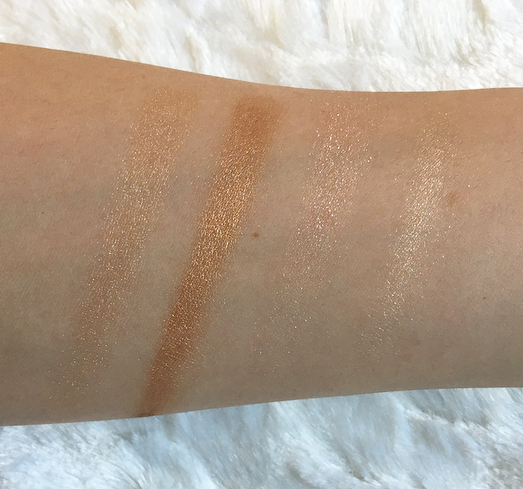 At first I thought that with my pale skin, I would only be able to use the bottom two shades, but I've actually been getting a lot of use out of the darker gold powder. The creamy bronze shade, however, is definitely too dark for me. It would look absolutely stunning on a darker skin tone! The powders have an interesting formula. They are very pigmented and shimmery, but they feel a little rough to the touch. I think that they could emphasize texture if you are older or have visible pores/lines around your cheekbones. None of these shades are for the faint of heart; they are definitely not for a natural glow! The rosy champagne powder has a chunkier formula than the gold powder, with some noticeable glitter in it. I like to apply the powders with a small tapered highlighting brush, though a fan brush would work well, too. I prefer the lighter, rosy powder shade but both can be sheered out for my paler skin. The cream shades I prefer to apply with my fingers. It almost seems to melt into your fingers, so I lightly swirl my finger in the palette and then dab it along my cheekbone. You can layer the creams and powders together to get a truly blinding highlight. Personally, I like this palette because of the variety, not the formula. Neither the powders nor the creams are the best formulas I've tried, but I love the option of using several different shades. I don't have shades like these in my collection already. This would be great to travel with and good for someone starting out with makeup who doesn't have a lot of highlighters already! If you already have a good amount of highlighters, I wouldn't recommend this unless you're really attracted to the shade selection. The formula isn't anything top-notch, in fact I have better, cheaper highlighters that aren't as glittery. This is obviously just my opinion and if you can, try to test this palette out in store to see if it might be right for you! You can get this palette online here or in some Ulta stores in the US. If you've tried anything from Sleek, I would love some recommendations! 15 comments on "Sleek Cleopatra's Kiss Highlighting Palette Review"
It's to bad it didn't live up to it's reputation. It looks so pretty. I still can't get my head around MAC being sold at Ulta now! Shame this palette isn't that exciting - I wish the products went on as pretty as they look, although at least it isn't too pricey? I've looked at the Sleek product at Ulta and wasn't crazy about any of them, and I guess this confirms it. The shades look pretty but it's too bad that the formula is subpar! i adore the sleek palettes and i actually don't have one in my collection which has to be changed. 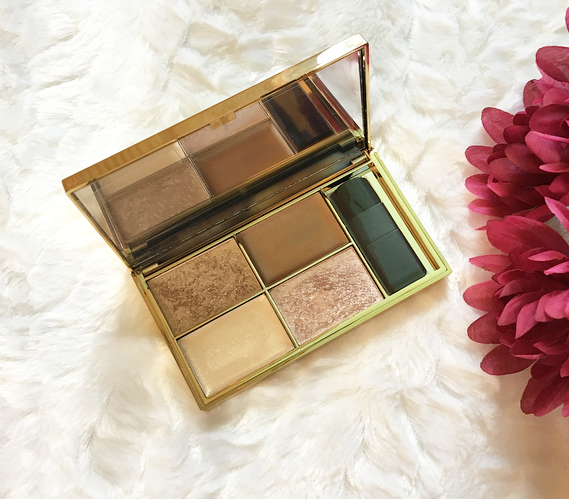 There have been so many mixed reviews on this palette so thank you for an honest one! ps: Did you change your blog layout? Yes I did haha! I felt like a change :) hope you like it! So many bloggers talk highly about this one! I'm surprised it didn't impress you the way you expected. Still, it is a beautiful palette. Sleek has become sooo popular! This palette looks amazing! I've been eyeing up this palette for a while now but seen many mixed reviews! Sorry the formula doesn't quite work for you. If you have Makeup Revolution where you live, I strongly urge you to try their highlighters... so cheap and very pigmented!